Our crushing & screening services are designed to provide you with the product you need in a limited amount of time here in Collingwood. At Flesherton Concrete Products, we have been providing the Collingwood, Ontario area with exceptional crushing & screening services since 1985. 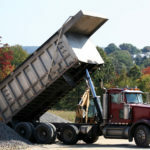 If you have large-volume needs for a pit, quarry, or other location, we can provide 10,000 tons or more of carefully crushed and screened gravel directly to your location for maximum convenience and benefit. Our largest crusher can produce gravel at a rate of 450 tons per hour, which equates to approximately 22 dump trucks an hour. Above all, our crushing & screening services are designed to provide you with the product you need in a limited amount of time, so you can continue with your operations without delay. We work hard to meet the diverse needs of our clients while maintaining competitive prices at all times. When you take advantage of our crushing & screening services, expect quality service complemented by an excellent product and price. Although our prices are what set our crushing and screening services apart, what really makes them stand out is that we strive to create beneficial relationships with each and every customer. Whenever you need quality gravel, you can rely on us to provide the materials you need at the right price every single time. Contact us at Flesherton Concrete Products today to find out more about our crushing & screening services and how we can meet your needs for quality, high-volume gravel. We look forward to hearing from you, meeting your needs, and forming a long-lasting relationship with your operation. At Flesherton Concrete Products, we offer crushing & screening services to customers in Collingwood, Wasaga Beach, Flesherton, Orangeville, Owen Sound, Barrie, Stayner, Mulmur, Shelburne, and Mount Forest, Ontario.